China’s Foreign Ministry announced Thursday that President Xi Jinping will pay a state visit to neighboring Mongolia from August 21 to 22. It will be Xi’s first visit to Mongolia since assuming office two years ago. Xi’s visit has been in the works for several months. Mongolian President Tsakhiagiin Elbegdorj traveled to China in May for the Conference on Interaction and Confidence-Building Measures in Asia (CICA) summit in Shanghai. 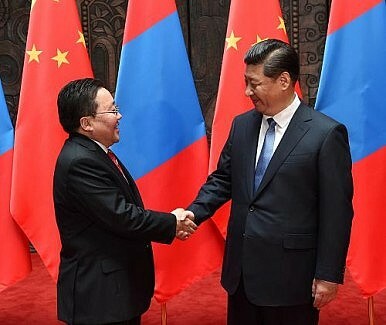 While in China, Elbegdorj met with Xi Jinping and invited him to visit Mongolia. In June, Chinese Foreign Minister Wang Yi traveled to Mongolia, and arrangements for Xi’s visit were presumed to be high on the agenda. China has good reason to be interested in Mongolia. The country is an important neighbor, sharing a long land border with China, and it’s also a key source of natural resources, especially coal. However, Mongolia can be overlooked in China’s high-level diplomacy, particularly as Beijing continues to expand its foreign policy agenda. China’s last top-level visit to Mongolia was by Premier Web Jiabao in June 2010. For the last presidential visit, we have to go all the way back to 2003, when Hu Jintao visited Mongolia as part of his first overseas tour along with stops in Russia, Kazakhstan, and France. Since then, there have been several bilateral meetings between the Chinese and Mongolian presidents, but they have generally taken place on the sidelines of larger regional events, such as Shanghai Cooperation Organization summits or the CICA summit. A dedicated top-level bilateral summit such as the one taking place next week is somewhat rare. Xi’s visit appears to be part of a concerted effort to reach out to Ulan Bator. In addition to Wang Yi’s trip in June, Chinese Vice President Li Yuanchao visited Mongolia in April. For its part, Mongolia considers developing a good relationship with China of “paramount importance,” according to a member of Mongolia’s parliament. Batchimeg Migeddorj told a group of Chinese journalists that developing ties with China “is a great chance for us” as Mongolia enjoys a wealth of natural resources that are currently feeding an economic boom. The two countries have indeed been deepening their economic relationship, especially this year, as Alicia Campi noted in a recent “China Brief” for the Jamestown Foundation. The Xi-Elbegdorj meeting in May displayed a particular focus on the mining, infrastructure, and energy sectors. It’s wise for China and Mongolia to seek to diversify their partnership now. Coal is currently one of the lynchpins of the economic relationship, but Beijing is actively seeking to lessen China’s dependency on coal in favor of cleaner energy sources. During his talk with Elbegdorj, Xi also mentioned his hope that China and Mongolia could move beyond economics, increasing the number of political and military exchanges. “The two countries should also strengthen exchanges between legislative bodies, political parties and armed forces,” Xi said. A push for more military cooperation may be a reaction to U.S. Defense Secretary Chuck Hagel’s own visit to Mongolia in April this year. The timing for this year’s bilateral summit with China is perfect for Mongolia. Ulan Bator has long sought membership in APEC , and as this year’s host of the APEC summit, China has the power to further Mongolia’s bid with a high-level invitation. India’s Prime Minister Narendra Modi has already received such an invitation; Mongolia is likely hoping to snag one as well. Xi Jinping has already pledged to support Mongolia in joining APEC. China, Russia, Mongolia Sign Long-Awaited Economic Partnership AgreementThe Trouble With China-Mongolia RelationsXi Jinping, Vladimir Putin Meet Ahead of SCO SummitChina’s APEC DiplomacyWill Xi Jinping Visit North Korea This Year?